This year end podcast reviews some of the 2015 releases I've enjoyed. We've got some holiday songs in there as well. Peace to all during the holidays and Happy New Year. This holiday season brings a feeling of hope for a just and peaceful world. This is the inspiration for this week's podcast. Featured is a set of Jimmy Greene's music in remembrance of the third anniversary of the Sandy Hook tragedy and to pay tribute to the victims and their families. This is a segment from my Thanksgiving show, but why should we give thanks only in late November? That set features songs inspired by my favorite holiday by Jimmy Greene, Miguel Zenon and Arthur Blythe. Lots more here including a couple of tracks by trombonist Michael Dease. The beautiful weather here in New England inspired this week's podcast. 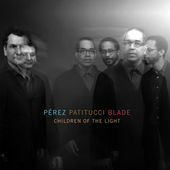 Of special note is the trio of Perez, Patitucci and Blade from their new album Children of the Light. The podcast ends with a spin on Return To Forever and rocks out with Lenny White's Shadow of Lo.